Editorials from Theslowlane: Reflecting in old telescope mirror. 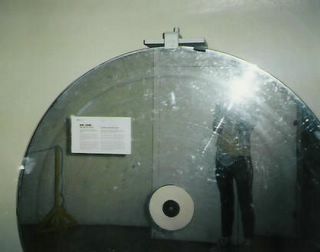 Reflecting in old telescope mirror. Reflecting in old telescope mirror. Taking picture of myself with a flash. Image from 1996 bicycle trip to Victoria, BC. Museum at base of Dominion Astrophysical Observatory. 10:52 PM Pacific Daylight Time July 3 (+ or - 3 minutes), if all goes as planned. A probe from Deep Impact spacecraft smashes into comet Tempel 1 to kick up dust. Then the spacecraft can get a look at what kind of material is "deeper down" inside the head of a comet. Tempel 1 is also being monitored by observatories around Earth such as the Hubble Space Telescope. Hopefully it will be a very educational blast. Learning more about comets may teach us about the first dust clouds that formed our solar system. Questioning more about creation, which to a large extent, we don't have a clue about still. There's also, supposedly, the big bang which created this universe and many questions about how order and life evolved on our planet. Questions as to whether something like life exists elsewhere in the universe. Religious dogmatists have thought they knew the answers to these questions for thousands of years. Many of them act like "know it alls" fighting over who's dogma is correct. Is it Islam, Christianity, Voodoo? Which interpretation? Fighting over different religions, there are often blasts of another kind, car bombs, or bombing raids from military aircraft. Religious dogmatists often repress those who offer new information, persecuting Galileo for instance. They thought they "knew it all" when the Sun went around the Earth. In past times, comets could mean great fear. Signs from an angry god. But, what about bothering to ask God? Not presuming we know it all. Not even knowing if God exists, or how do we define "God?" Admitting that there are still more questions than answers can be seen as a sign of weakness, in the eyes of machismo warriors. Questioning can also be seen as a sign of modesty, humbleness; true virtues. It seems like scientists tend to be humble. Willing to question. To dialog. Scientists often using phrases like, "We need to go back to the drawing board." "Rewriting our understanding of..."
Asking the questions and not claiming to know all the answers yet. That is a quest which is pursued by scientists, among others. Putting aside all the energy we spend on wars, arguing over who's right. Some folks are actually bothering to ask, "what's out there in the universe?" If the deep impact succeeds it can be a blast. This blast for peaceful questioning of the cosmos.